Dedicated to 5 year old Georgie Filer V whose motto was “Be Happy” and Eddie Pedrick my grandsons who drowned and my two beautiful daughters Elizabeth Lynn and Dr. Victoria Anne Filer last year. People who read these files are some of the most intelligent people on Earth because they have exceptional knowledge and understanding, have awareness and know more, and are quick to learn what most people on Earth do not. Last year, had many important events that helped the release of information concerning the UFO phenomenon that will likely increase in the coming year. The people have watched in darkness has seen great lights nightly in the skies. Thousands of orbs are witnessed monthly and there are over 2000 reported sightings each a month and interest is growing from the public as websites, Television and radio programs grow in importance. The PRG Congressional Hearing Initiative is tentatively set to launch on January 8, 2014. A full set of DVDs of the Citizen Hearing on Disclosure CHD will be sent to each congressional office. The plan is for each DVD set to be accompanied by a letter signed by the CHD witnesses. The Citizen Hearing on Disclosure held at the National Press Club in Washington D.C. was both unusual and powerful. It was unusual because the testimony focused on the history of events and evidence pointing toward an extraterrestrial (non-human) intelligence engaging the human race now and in the past. It was powerful because of the transformative impact the testimony had on the sitting committee of six former members of Congress, all of whom held skepticism on the subject matter. Gary McKinnon, the English hacker facing 70 years in U.S. prison for searching Pentagon sites for UFO evidence, extradition was blocked on November 19, 2013 and also he will not be imprisoned by the U.K. The hacker claimed there were hackers from Denmark, Italy, China, Germany, Turkey, Thailand… every night for the entire five to seven years I was doing this. Prime Minister David Cameron has stated, “I do recognize the seriousness of this case, and the Deputy Prime Minister and I actually raised it with President Obama when he visited. I think the point is that it is not so much about the alleged offence, which everyone knows is a very serious offence, and we can understand why the Americans feel so strongly about it. We have confirmation from a Senator the US has a Space Force that apparently is designed to fight off alien intruders? Perhaps the Star Wars program was real and ultimately successful? You’ll need to go back to the words of President George H.W. Bush in June of 2001 to discover US plans to build a military base on the moon! Does our President know about the alien presence? According to Stephen Bassett, Executive Director of the Paradigm Research Group, he likely does. Bassett claims that John Podesta one of Obama’s advisors was his transition appointee and is now a newly hired Obama consultant is an acknowledged X-Files buff, who encouraged full disclosure of UFO files at the National Press Club. The Strategic Defense Initiative (SDI), also known as Star Wars, was a program first initiated on March 23, 1983 under President Ronald Reagan. The intent of this program was to develop a sophisticated anti-ballistic missile system in order to prevent missile attacks from other countries, specifically the Soviet Union. The nickname “Star Wars” was attached to the program for some of its abstract and science fiction ideas, many of which included lasers, subatomic particle beams, and computer-guided projectiles fired by electromagnetic rail guns—all under the central control of a supercomputer system.” By using these systems, the United States planned to intercept intercontinental ballistic missiles and perhaps UFOs while they still flew high above the Earth. One interesting point was that President Reagan publicly offered the Star Wars system to the Soviet Union and spoke about the nations of Earth joining to fight an extraterrestrial force. It became the most expensive weapons system in the history. Reagan’s comment was revealing since the Space Shuttle held a maximum of eight people and only five were built for space flight. Five times eight is forty, suggesting 260 others could be in space. Was Reagan revealing the existence of a highly classified space program that could accommodate hundreds of astronauts in orbit? Thirty years later it likely exists and Russian and American astronauts are in space together. By the end of SDI, the primary focus of the weapons design group was focused on “land based kinetic energy weapons.” These weapons were essentially guided missile projectiles. At the end of the Strategic Defense Initiative, thirty billion dollars had been invested in the program. The original Star Wars System as changed according to prime contractor TRW: Working in pairs for stereoscopic viewing, the SMTS is the low earth satellite orbit component of the Space-Based Infrared System (SBIRS shown here). Its unique capability to track missiles throughout their trajectory allows the system to effectively cue missile defense systems with accurate targeting data. The satellites developed precise location, velocity and acceleration data on the enemy vehicles. The planned interceptors can engage threats at ranges beyond the capabilities of their associated radars. Using data generated by SMTS, these interceptors can use that excess capability to negate attacking missiles far from friendly forces and population centers. This shoot-look-shoot option reduces interceptor inventory requirements. Early intercepts made possible by SMTS extend the boundaries of the defended area some three to five times. SMTS can precisely cue ground radars; allowing them to limit operations until a hostile missile is within their range. This reduces the threat from homing anti-radiation missiles — likely players on modern battlefields. The constellation provides global surveillance for ballistic missile launches within seconds. Dr. Sam Osmanagich Ph.D., director of Center for Anthropology and Archaeology at the American University in Bosnia has authored 11 books about ancient civilizations. He claims many Pyramids are 10,000 to 25,000 years old and built well before mankind was sophisticated, had agriculture or cities. The question is did ancient civilizations build them or are ancient aliens responsible for a worldwide pyramid construction system? Twenty Chinese Pyramids on Google Earth are shown here. The builders of hundreds of pyramids are thought to have been blonde, blue eyed, light skinned called Nordic aliens whose bodies are often found nearby. Oldest Chinese and Egyptian pyramids are much superior to those made later, as unsuccessful replicas. Older pyramids are built from granite and sandstone blocks, more recent ones are much smaller built from bricks and mud. Traces of more advanced beings who were likely alien are everywhere around us. In the meantime, mainstream scientists try to fit those monuments into their time coordinates, falsifying the truth. Hundreds of pyramids are being found all over the Earth including under the sea like the three found off the coast of Florida. It is apparent that ancient aliens or a previous sophisticated civilization existed on Earth. The Archaeological Park: Bosnian Pyramid of the Sun Foundation is conducting time the pyramid investigations in Bosnia and has become the world’s largest inter-disciplinary archaeological project. This discovery is historic and changes the early history of Europe since these are the first pyramids discovered in Europe, and is the largest pyramid structure in the world at 220 meters is much higher than the Great Pyramid of Egypt (147 meters). It has precise orientation towards cosmic north and the soil covering the pyramid is 12,000 years old. There is an extensive underground tunnel network which runs for more than ten miles. CALAKMUL, MEXICO (INTELLIHUB) — Newly released Mayan documents, i.e. artifacts, dating back at least 1300-years reveal that the human race is not alone and highly advanced technologies including space travel have likely existed for quite some time. Not only does this documentation released by the Mexican government show the existence of an explorer race, it may also reveal the roots of mankind. The Mexican government is releasing information held for 80-years. Producer calls it the most important archaeological finding in the history of mankind. Julia-Levy, who is producing alongside Ed Elbert (Paraiso Travel), says the mother of all secrets will be revealed at the Calakmul archaeological site, though he declined to specify what could possibly trump the aforementioned findings. The documentary also unveils a 3,000-year-old spacecraft landing pad that was allegedly built atop a rock structure capable of holding electromagnetic energy. The government’s presentation of the information to be a major step forward for humanity as the truth is finally being let out. Hopefully this will prompt other governments around the world to be more forthcoming with such information, turning the tide in the UFO and extraterrestrial research community for good. Sundance winner Juan Carlos Rulfo’s Revelations of the Mayans 2012 and Beyond also touches on such technology. Pre-Columbian Art shows artifacts of possible alien craft and some of their pilots from Tumaco, Columbia on the Pacific Ocean or the La Tolita Culture. (600 B.C. to 200 A.C.). Standing figure is thought to be 2000 years old and has a remarkable likeness to the description of grey aliens. Its importance is suggested by its gold construction. It appears to have six fingers. Colombia or Ecuador. Metropolitan Museum of Art. New York. Researcher L.A. Marzulli has filmed an excellent documentary called Watchers 7. The newest video in the Watchers series, Watchers 7, called “Something is Happening” has wonderful UFO scenes provided by Jaime Maussan in Mexico City. He has the longest running UFO television series around the globe. Jose Escamilla has exciting footage of a pyramid and other structures on the Moon’s surface as shown here. Marzulli shows intriguing UFO footage captured in Kumburgaz, Turkey which may show actual ET inhabitants in the craft. There are metal samples taken from a sphere that supposedly fell from space into a field that does not come from Earth. Regarding alien implants removed by Dr. Roger Leir, they could be a type of highly sophisticated computer. Marzulli claims hybrid beings are being integrated into the population via abduction and breeding programs, and the ETs (who are the “fallen ones” from the Bible) are creating their own army. The section in the film on the Vatican suggests they are getting ready to reveal an ET connection. Watchers 7, is chock full of sensational and rare video footage that is 83 minutes in length and loaded with one-on-one interviews with prominent theologians, abduction victims, and UFO researchers like myself. Dr. David Jacobs, a former professor at Temple University in Philadelphia is interviewed in his home where he shares his 30+ years of abduction encounters from well over 1,000 victims. His conclusion is this breeding program is a “replacement” program. https://nationalufocenter.com/ to play Watchers 7 trailer. ZAOSTROVKA — Well known Russian UFO investigator Nikolay Subbotin relates an amazing story of a battle of flying saucers. This incident allegedly took place on September 16, 1989, when six circular, silver, flying saucers ganged up and fought a seventh, golden saucer, in full view of the residents of the town. Hundreds of witnesses watched the gang of six chase the golden saucer out of a cloud bank. According to the RUFORS Internet newsletter, an account of this event was published in the local newspaper, and a Russian helicopter commander in the Afghan war, the energy emitted during this battle shut down the local power grid. plunging the city into total darkness for a time. The author, named Sichenko, interviewed witnesses of the event, publishing many of their fantastic accounts of the events that day. The witnesses claimed that the outnumbered golden UFO finally was defeated, losing altitude due to the continued hits by the energy beams, losing control, and plunging to the ground. The six assaulting saucers soon disappeared from view. China has landed its Chang’e 3 first robotic Lander on the moon on December 14, 2013, with color images. The moon rover Yutu, or “Jade Rabbit” landed in the moon’s Bay of Rainbows the Earth’s first landing in 37 years. Seeking a clean energy solution, China is searching for helium-3 that is a light, non-radioactive isotope of helium that is nearly nonexistent on Earth, yet abundant on the moon. It is considered the missing piece needed to create fusion power a new source of energy without radiation. My opinion is that the number of UFO reports will continue to rise as will Standard & Poor’s 500 Index will advance 11% in 2014, rising to 2,000. That will take the closely watched index up to the highest level in history. A turbulent period is ahead for the Earth’s climate, including more severe storms, and volatility in the weather and seasons. The environment is struggling in part due to actions by the humans and activity on the sun. Volcanic activity over a number of different areas and Earthquakes, tornadoes, hurricanes and flooding in places such as the Midwest will continue. The terrorism threat will continue. More serious effects of the Fukushima disaster will be felt in the Northern Hemisphere and the Pacific Ocean. The dollar is in danger and other currencies may be better to hold. SYLMAR — From December 23rd through December 25th, 2013, I have seen the same light in the sky. On December 23rd, around 7:00 PM, just after dusk I was walking my dogs when I saw an extremely bright white large light very low on the horizon. I stopped and took a video of the light that stood out because it was so much brighter than anything in the sky. A helicopter started circling it, and after observing for an hour or so I brought the dogs back in the house. When I came back out an hour later the light was gone. NORWALK — It was about 7:30 PM, on December 24, 2013 and I went out to untie my dog and noticed a light in the sky heading towards me. I realized there were no red or green flashing lights a plane would have. As it got closer I noticed it had a semi-oval shape and a second identical craft appeared at 11 PM. I knew I was looking at something different so I called my wife to come out quick. MARKLEVILLE — I was in my office in my garage when I picked up an older 3.2 MP, HP 733 Digital Camera and went outside and took shots of the sky. It was late 10 PM to 2 AM, and snapped four consecutive pictures one right after the other. I did NOT see the object. – BELLEMAWR – Here are some orbs for taken on December 17, 2013, at 4 AM. You will see that they are coming from every direction, onto the concrete slab. Do you have any thoughts on what they may be because my research finds nothing that can fly through things? WINSTON — Witness and I have observed strange lights in the Riverbend Park during the summer and on October 26, 2013, when I got this photo. Lights are often seen just before it gets dark and between 2 AM and sunrise on clear nights. The lights seen in the park react to a laser pointer by moving closer, and farther away. The lights are between the school and the mountain behind it. ANTHONY — I stepped into my backyard at about 8 PM on December 28. 2013, when I noticed an orange light to the east, I felt it was a really bright star because I knew that Jupiter was elsewhere, within my field of view. Two minutes later, I noticed another similarly colored object was right next to it. The object to the right was very noticeably red so I ran inside to get my camera. TOWNSVILLE, QUEENSLAND – A bright blue light was seen passing north from our balcony facing the radio towers in Townsville on December 15th 2013. The light performed a sweeping loop near Castle Hill, before travelling fast erratically performing huge dips. It was almost as bright as Venus and was flashing blue. It would occasionally go behind low lying clouds. Six witnesses saw it about 8:30 PM. I was at home when I spotted a stationary object in the sky on April 11, 2012. I took my camera and went to the balcony. I observed an object for about 1 hour. During whole observation the object hung in the same position. When the object left I didn’t see it. BARNSLEY, SOUTH YORKSHIRE —Two very large and brightly lit objects underneath were seen on December 14th/15th, 2013 from 11 PM, through to 7 AM. One was over the fields seen from our front window and the others were at the back of the house. Smaller orange objects were lit a distance away from these two. They were viewed on the same night at the same times. They switched places and travelled over the house. This is not the first time I have seen UFOs here. WHITSTABLE, KENT — On December 13, 2013, at 4:25 PM, I observed a an Ovaloid shaped looking UFO with a tremendous white brightness that was hovering over Ashley Drive and the Faversham Road in Whitstable. The object was hovering at an altitude of 200 feet above ground level at 4:32 PM. It seemed to grow brighter and lighter in radiance, with electromagnetic distortion emanating from the hovering object. STERLING — I saw something on December 1, 2013, at around 7:.30 PM I can’t explain. I am ex military and a bit of an aviation enthusiast so am quite familiar with most of the aircraft in our skies. On Sunday evening my girlfriend and I were travelling home on M-9 south en route to Glasgow. My friend and I became aware of a large gold light above the Gargunnock Hills. I am familiar with aircraft landing lights and they are seldom gold and don’t remain in the same location or shine with the intensity these light were shining with. 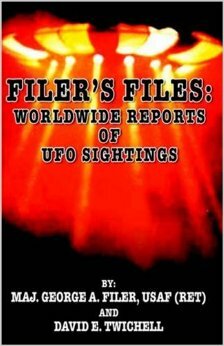 I am offering sixteen years of Filer’s Files on a DVD with thousands of photographs and sightings for a donation of $50 that includes this year’s subscription. Please use this link to receive this offer. Next: Asteroid Hits Earth Over Atlantic, Broke Up, Crossed Venezuela And Landed In Pacific!